New York, Dec 12 (Just News): An upturn in the global economy—now growing by about 3 per cent—paves the way to reorient policy towards longer-term issues such as addressing climate change, tackling existing inequalities and removing institutional obstacles to development, according to the United Nations World Economic Situation and Prospects (WESP) 2018, launched Monday in New York. “The World Economic Situation and Prospects 2018 demonstrates that current macroeconomic conditions offer policy-makers greater scope to address some of the deep-rooted issues that continue to hamper progress towards the Sustainable Development Goals,” stated UN Secretary-General António Guterres in the Foreword. According to the report, in 2017, world economic growth has reached 3 per cent—the highest growth since 2011—as crisis-related fragilities and the adverse effects of other recent shocks subside. The improvement is widespread, with roughly two-thirds of countries worldwide experiencing stronger growth in 2017 than in the previous year. Global growth is expected to remain steady at 3.0 per cent in 2018 and 2019. 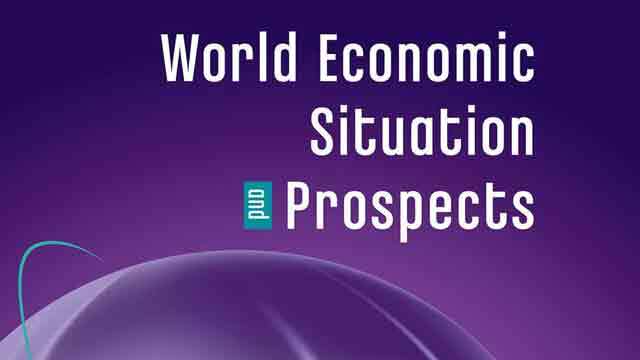 The recent pickup in global growth, the report states, stems predominantly from firmer growth in several developed economies, although East and South Asia remain the world most dynamic regions. In 2017, East and South Asia accounted for nearly half of global growth, with China alone contributing about one-third. The end of recessions in Argentina, Brazil, Nigeria and the Russian Federation also contributed to the rise in the rate of global growth between 2016 and 2017. The upturn has been supported by a rebound in world trade and an improvement in investment conditions. The challenge is to channel this into a sustained acceleration in productive investment to support medium-term prospects. Despite the improved short-term outlook, the global economy continues to face risks—including changes in trade policy, a sudden deterioration in global financial conditions and rising geopolitical tensions. The world economy also faces longer-term challenges. The report highlights four areas where the improved macroeconomic situation opens the way for policy to address these challenges: increasing economic diversification, reducing inequality, supporting long-term investment and tackling institutional deficiencies. The report notes that reorienting policy to address these challenges can generate stronger investment and productivity, higher job creation and more sustainable medium-term economic growth. The recent improvements in economic conditions, however, have been unevenly distributed across countries and regions. Negligible growth in per capita income is expected in several parts of Africa, Western Asia and Latin America and the Caribbean in 2017–2019. The impacted regions combined are home to 275 million people living in extreme poverty, underscoring the urgent need to foster an environment that will both accelerate medium-term growth prospects and tackle poverty through policies that address inequalities in income and opportunity. The report found that very few least developed countries (LDCs) are expected to reach the Sustainable Development Goal target for GDP growth of “at least 7 per cent” in the near term (SDG 8.1). Advances towards sustainable development in this group of countries continue to be hindered by institutional deficiencies, inadequate basic infrastructure, high levels of exposure to natural disasters, as well as challenges to security and political instability. In addition to mobilizing the financial resources to meet the investment needs in the LDCs, policies must also focus on conflict prevention and removing barriers that continue to hinder more rapid progress. Preliminary estimates suggest that the level of global energy-related CO2 emissions increased in 2017 after remaining flat for three consecutive years. The frequency of weather-related shocks continues to increase, also highlighting the urgent need to build resilience against climate change and prioritize environmental protection. Policies that target international shipping and aviation emissions—which do not fall under the purview of the Paris Agreement—need to be strengthened, as emissions from these sectors continue to grow faster than those from road transport. Many developing economies and economies in transition remain vulnerable to spikes in risk aversion, sudden capital withdrawal and an abrupt tightening of global liquidity conditions, while rising debt poses global financial challenges. The report suggests that a new financial framework for sustainable finance should be created in alignment with the 2030 Agenda and the Addis Ababa Action Agenda that would shift the focus from short term profit to long term value creation. Regulatory policies for the financial system, well-coordinated with monetary, fiscal and foreign exchange policies, should support this framework, by promoting a stable global financial environment.